Ben Hardy Photos, News, and Videos | Just Jared Jr.
Ben Hardy heads out of the BBC Studios on Wednesday morning (May 11) in London, England. The 25-year-old X-Men Apocalypse actor made an appearance on BBC Breakfast, opening up about his character, Angel. Sophie Turner & Tye Sheridan Celebrate 'X-Men: Apocalypse' at Fan Event! Sophie Turner and Tye Sheridan step out on the blue carpet for the X-Men: Apocalypse fan screening held at the BFI IMAX on Monday (May 9) in London, England. Also in attendance at the big, live-streamed event were Alexandra Shipp, Lana Condor, Ben Hardy, and Evan Peters, who are all also starring in the upcoming movie, which will hit theaters on May 27. Be sure to check it out! FYI: Sophie is wearing a Balmain dress, Jimmy Choo heels, Tyler Alexandra clutch, and De Beers jewels. 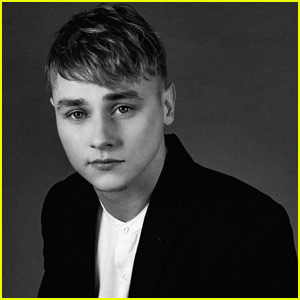 Ben Hardy looks super cute in a new photo shoot for Fault magazine’s issue #23. On the future of the X-Men films: As far as I know, the original X-Men actors will remain in the franchise. But I think there is a great young cast in Tye Sheridan, Sophie Turner, Alex Shipp and Lana Condor, who have so much talent to bring to X-Men in the future. For more on Ben, visit Fault-Magazine.com. Ben Hardy strikes a pose on the May 2016 cover of Attitude magazine, available online now and in print April 27. The 25-year-old actor, who plays Angel in the upcoming X-Men movie, chatted about his first Attitude shoot and what he’s learned from his X-Men co-stars. Check it. For more from Ben, please visit Attitude.co.uk. Kodi Smit-McPhee lets out a hiss as Nightcrawler on his own Empire cover for the May 2016 special X-Men: Apocalypse issue. The 19-year-old actor joins Jennifer Lawrence as Mystique, Evan Peters, as Quicksilver, Sophie Turner as Jean Grey, Tye Sheridan as Cyclops, Alexandra Shipp as Storm and Ben Hardy as Archangel. 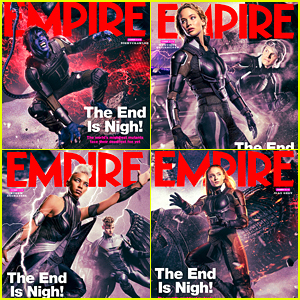 Also with their own covers are Olivia Munn as Psylocke and Rose Byrne as Moira MacTaggert; Nicholas Hoult as Beast and James McAvoy as Professor X. Check out all the covers below, all available on March 31st. 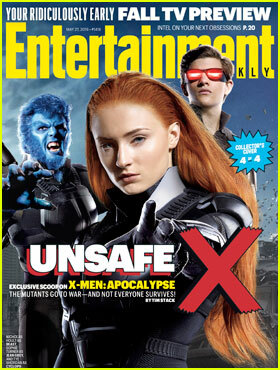 For more on Jennifer and the cast, visit EmpireOnline.com. Don’t forget – X-Men: Apocalypse hits theaters on May 27th!